“Air travel in winter months adds a dimension of stress for anyone, seasoned or not,” said Scott Triphahn, vice president of Flyte Systems. “Having a real-time glimpse of your flight’s status removes some of that anxiety and gives you a heads up if flights are delayed,” he said. For hotels equipped to handle an unexpected flood of incoming guests, weather events can directly translate into increased bookings. 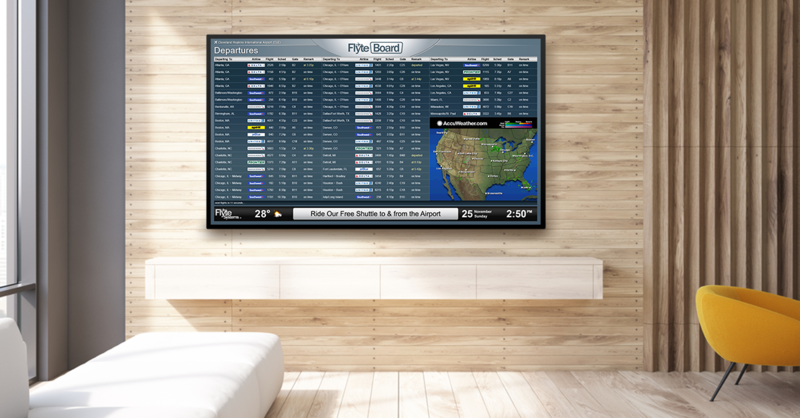 FlyteBoard aids in your hotel staffing decisions, providing advanced notice of mass flight delays & cancellations and preparing employees for incoming crowds of stranded travelers. Additionally, guests and staff can track where storms are heading in real time with Doppler radar. Interested in a FlyteBoard for your hotel? Let us know here!